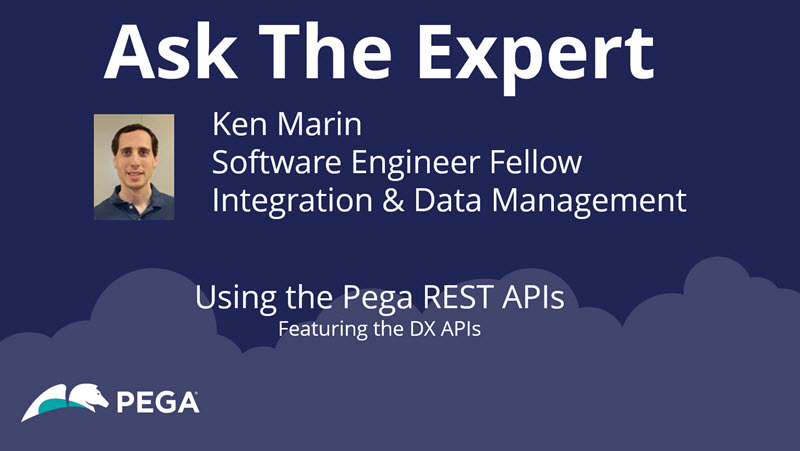 Join Ken Marin in this edition of Ask the Expert - Using Pega REST APIs, featuring the DX APIs! Ask your questions April 15th - April 26th! Meet Ken: Ken joined Pega way back in 1997 and has worked all over the product, though mostly in the areas of Case Management and Process Engine. Today he’s working on the next generation of product APIs which will facilitate componentization of the rules space, as well as building up our suite of application REST APIs to allow our customers to create their own screens and call Pega as a service. Message from Ken: Bring your questions about the new DX APIs and running your applications through stateless service calls into Pega. With regards to the REST API and regarding the DX Architecture. Can you elaborate on the future roadmap of the API's so we know what is coming? Also, where can one find documentation for the current DX API's? What a 'new row' looks like for grids & repeating dynamic layouts so you can add a row without a trip to the server. Page instructions for row level operations such as insert, append, update, delete, and move. A flat list of fields option for retrieving section (view) and harness (page) metadata, for callers who want the fields without the layout structure. @MARIK thank you for the reply. the current and future items look very appealing..